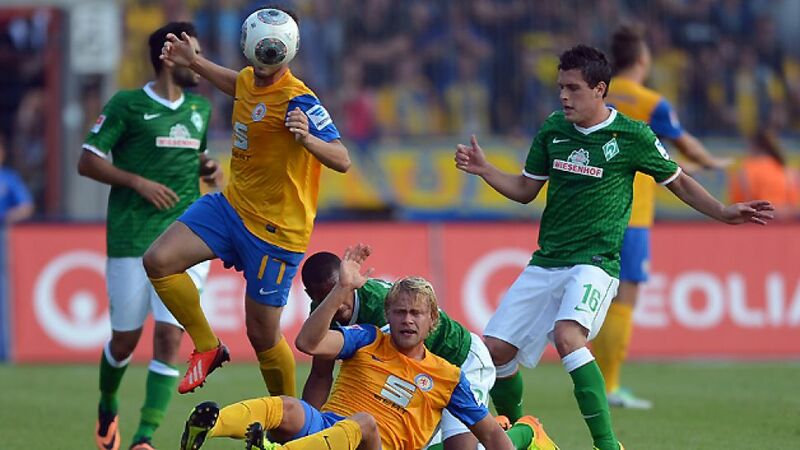 Braunschweig - There was to be no fairytale return to the Bundesliga for Eintracht Braunschweig, after SV Werder Bremen took the points with a 1-0 victory in a tight encounter. With the game heading for a stalemate, Zlatko Junuzovic snatched a late winner for the visitors with a neat finish after Sebastian Prödl's through ball. This was Braunschweig’s first top-flight clash in 28 years and the home fans were clearly relishing their heroes’ return to the big time, creating a roaring atmosphere in the opening stages at the Eintracht-Stadion. Things were much more subdued on the pitch, however. The first quarter of the match was cagey to say the least, with Braunschweig happy to get men behind the ball and Bremen unable to break them down. Braunschweig fashioned the first real opening of the game when Ken Reichel’s cross was met by Jan Hochscheidt, but the youngster failed to connect properly and his header flew high over the bar. At the other end, Bremen’s Nils Pedersen headed a corner from the left straight at Marjan Petkovic – the visitors’ best chance of the half. Both teams started the second period in brighter fashion and the visitors came very close to taking the lead minutes after the restart. Mehmet Ekici’s free-kick was fumbled by Marjan Petkovic in the Braunschweig goal and just as Petersen seemed certain to prod his side in front, the keeper managed to hook the ball away with his foot. Reichel then tried his luck at the other end with a powerful drive from the edge of the box which flew over Sebastian Mielitz’s bar. Reichel came even closer five minutes later: His sweetly-struck shot from distance beat the Bremen custodian, but not the woodwork as it cannoned off the crossbar. Braunschweig were in the ascendancy and the home faithful were responding. Yet despite enjoying the better of the second half, the hosts fell behind with just eight minutes remaining. A Prödl clearance found its way through to Junuzovic and the Austrian made no mistake, firing the ball high past Petkovic to break the deadlock and Braunschweig hearts. It was cruel on the home side, but they almost grabbed an equaliser two minutes from time. An Ermin Bicakcic cross was cut back to Hochscheidt, but Luca Caldirola was in the right place at the right time, blocking the youngster’s effort and securing the win for the visitors.